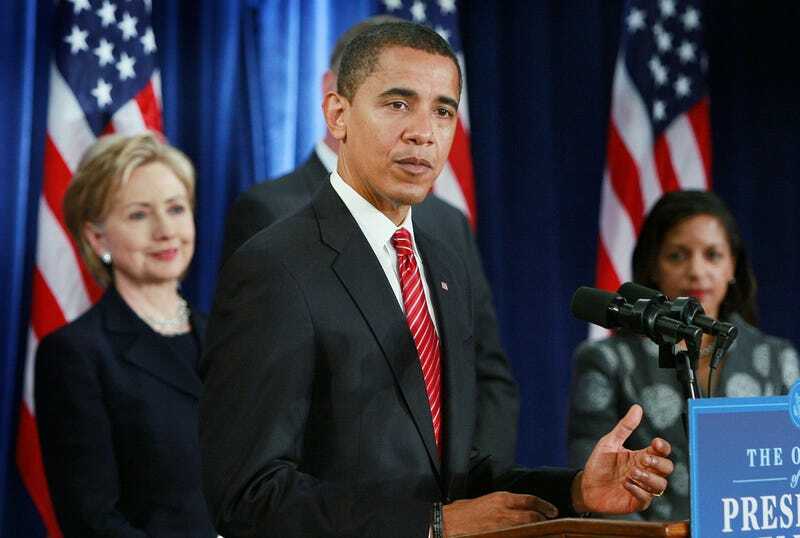 The Many Ways To Say "Hillary Stole Obama's Balls"
The suggestion that the president may have heeded several liberal interventionists in his own administration — including Hillary Clinton, U.N. Ambassador Susan Rice, and National Security staffer Samantha Power — has inflamed a boys-against-girls war. Just ask Andrea Mitchell. Naturally, this is very upsetting to several guardians of traditional masculinity, whether they support U.S. military intervention in Libya or not. The National Review's Mark Krikorian alone could fill a list of greatest hits. But why let him have all the fun when at least one lefty wants in too? Here, a sampling. "The broader [lesson to Libya]... is that our commander-in-chief is an effete vacillator who is pushed around by his female subordinates." (Mark Krikorian, "They Know Who Wears The Pants In This Country," National Review's Corner blog. "I don't know how many people have died as we wait to do something. Thank God for strong women in the Obama administration." U.S. Senator Lindsey Graham, Fox News. Maureen Dowd, ball's in your court. Obama's balls! There, I gave you your lede. You can expand it into an original analysis of how Hillary and her mean girls (one of whom previously resigned after calling her a monster) formed a high school-style emasculating clique.